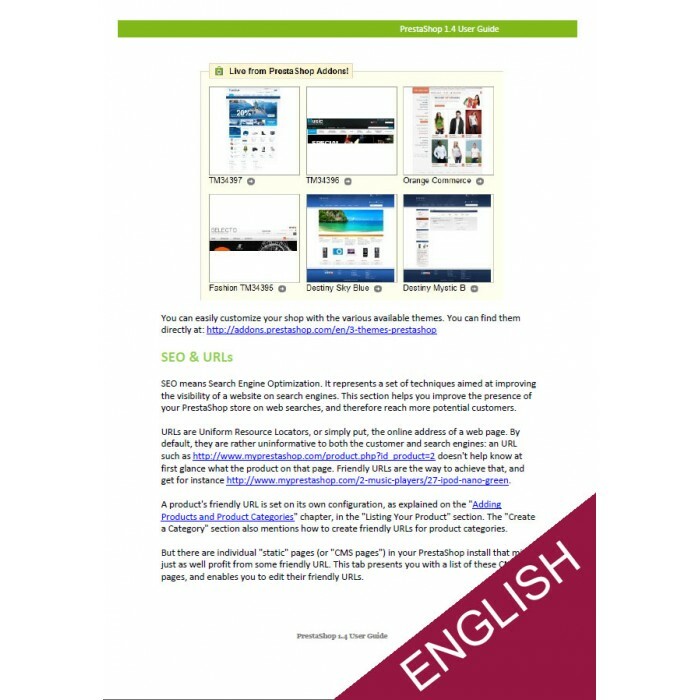 300 pdf pages to enjoy 100% of PrestaShop's 275 features, improve your sales and save time! Enjoy 100% of PrestaShop's 275 features! 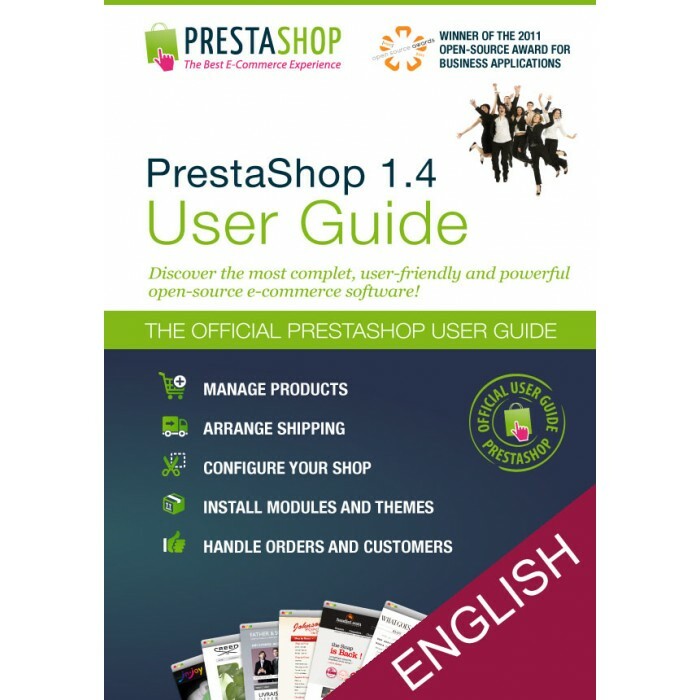 Finally downloadable in PDF form, this PrestaShop 1.4 User Guide contains the official text produced by the PrestaShop Documentation Team. Through its many chapters, this book provides you with all the necessary information to get started with you very own online shop. Discover its many unique features and how to enable them in order to get the most out of this open-source application, and bring more customers to browse your catalog. Learn how to customize your shop with themes and modules, improve your sales by knowing how to read statistics, and quickly take your shop idea from a wild dream to a profitable venture! Have you installed the new PrestaShop 1.5 version ? 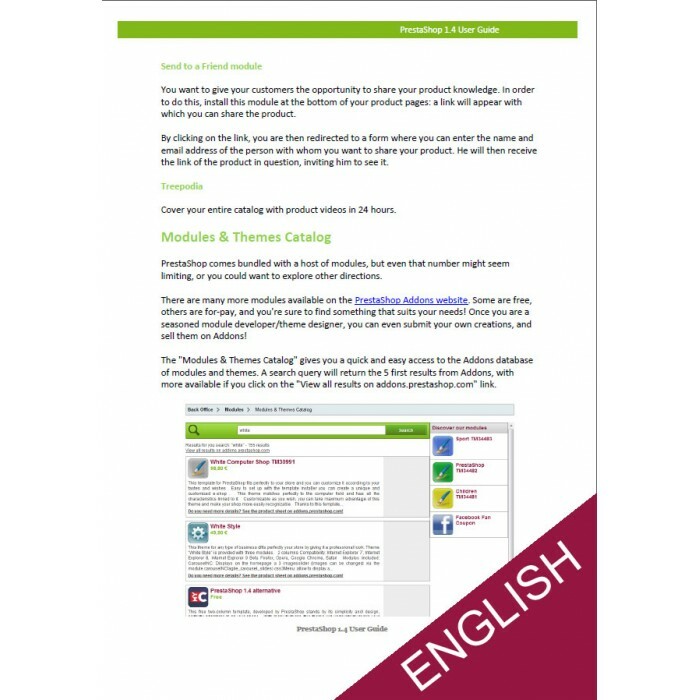 Click Here to find the new User Guide for PrestaShop 1.5 ! This is a single-user license. You are not allowed to share it. By ordering this documentation, you could download the PDF form of the user guide in your account. Breng uw product pagina's tot leven op uw site en maken ze interactief door het toevoegen van video's! De Product Video’s - YouTube module is de ideale manier om het succespercentage van uw producten te verhogen. Hiermee kunt u eenvoudig en automatisch uw YouTube-video's importeren en voeg ze in waar u maar wilt op uw productpagina's.